Quinoa (pronounced keen-wah) has been grown for thousands of years in the Andes mountains in South America. It is often thought of as a grain, but it is actually the seed of a leafy green plant called Chenopodium (also known as goosefoot), which is related to Swiss chard and spinach. The first time I encountered quinoa I was living with my cousin in Manhattan on the lower east side. She was not the most handy person in the kitchen. When I walked in she yelled from her bedroom that the air-popper may be broken as she tried to “pop” the little seeds like you would pop corn and they got sucked into the air vents. Bring water or broth to a boil (if using water add salt). Add quinoa, lower heat, cover and simmer until all of the liquid is absorbed (15-20 minutes). 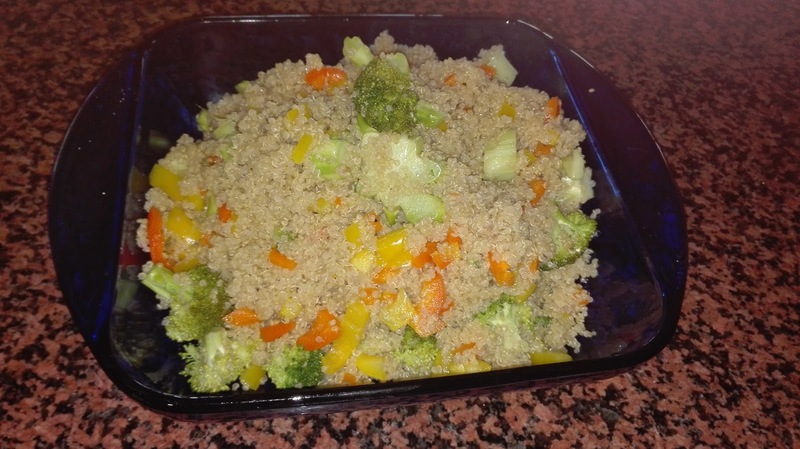 Add broccoli to quinoa the last 5 minutes and allow to steam on top to just soften. Add the bell peppers to cooked mixture. In small bowl, whisk the oil, lime juice, salt and pepper well. Pour over salad. This can be eaten hot, cold or room temperature.